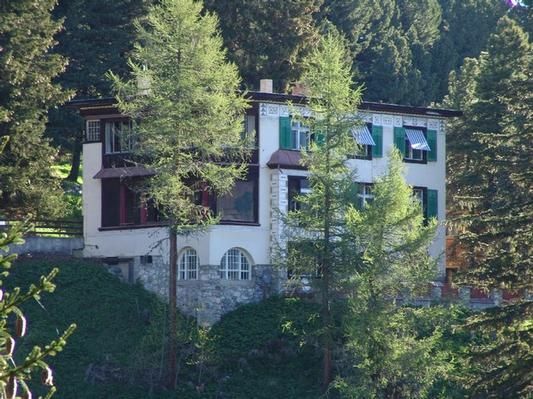 The Villa Guarda provides 235 m² of exclusive living space is 50 meters from the Art Nouveau Hotel Schatzalp away, in the midst of large a 470,000 m², located imposing Forest Park, dominated by the unique view of the Davos mountains. Here the peace is even greater, nature even more beautiful. The Villa Guarda was built in 1907 and already described in Thomas Mann's Magic Mountain as 'the medical center'. The level is high. An extravagant suite, a living room and a Bureau-Fumoir let dreamlike holidays or important meetings. Thoughts are free - the horizon is far. Traditionally, our gardener lives in the basement apartment and watches. The charm of the old villa remains, the furnishings and infrastructure appear in a modern design. Two bedrooms, one with a huge window front, two bathrooms, living room. Large two-part salon, massive table for up to 12 people, sitting area with fireplace, Arvenstübli with large windows. Bright room in a rustic dress with modern facilities, massive table for 10 people. - Final cleaning: once per object included in the price. - Pet: per object and day costs of 12 EUR (compulsory). - Parking: per object and day to rent for 15 EUR (compulsory). - Local tax / tourist tax: per person and day costs of 3. 5 EUR (compulsory).